…while the human and some of the Quimper Hittys are off to the Ozarks. There they plan to make the acquaintance of some Hitty friends and bring home a sister! We will respond to comments upon our return! Arianell’s attention to the cats is surely a cozy and warm experience for all in these cooler days of autumn…winds and rains..and clouds. Having a cat on your lap can be very warming! 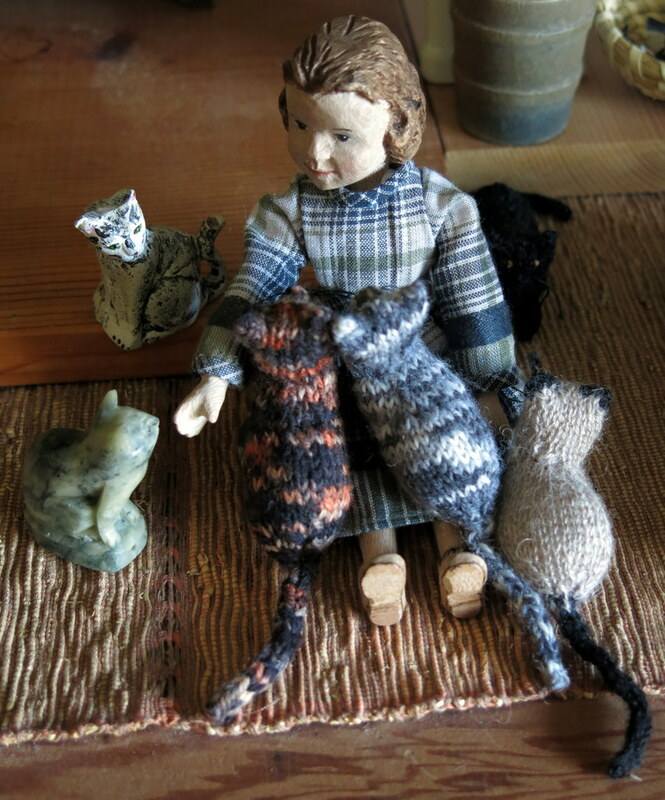 Arianell’s pet cats look like they are staying close to her in the absence of the Quimper human…there is nothing like the attention of loving pets to keep us safe and happy. The cats are glad to have someone to pet and play with, and especially FEED them! Arianell seems to have quite a way with the wee felines. We are quite admiring of her feline flock. Arianell loves the “clowder of cats!” that lives in the Hitty cupboard, and they do seem to flock around her ankles especially around dinner time! !